Acherontas has really been active during the last years. We were about to recover from the impact of Vamachara (2011) but now these Greeks are kicking our esoteric butts again with split albums and this year’s Amenti full-length. However, I’m quite surprised that I haven’t checked this latest offering yet, because Vamachara was a stellar piece of work (and one of my favourites from that year): quite traditional black metal but still veiled with mysticism and a strong aura of magick and incenses. Actually the trick was to make music that it’s so traditional that it sounds original – if you get my point. But this interview… Well, I guess there was a language barrier between us so please forgive the “too mystic” vibe of this conversation. Or then I’m just not deep enough in the dark arts than I thought to be. Still, this all indicates how penetrating the world of Acherontas is. – The upcoming album is entitled Amenti. 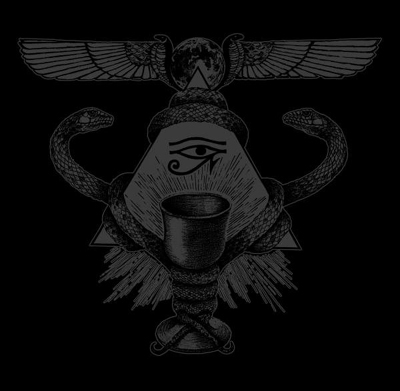 By this name we wanted to charge the release with the vibrations of a glorious Egyptian symbolism , to denote the route of the work and reveal one more element of the coven’s quintessence. The Halls of Amenti were a vortex of unlimited energy according to the Papyrus of Ani , the center of the world. A place of judgement and deliverance. – The Drakkonian Force reigns supreme to offer to those with the potential a touch of initiation in her waters.. The catacombs bare a strong symbolism, the great spiritual ascension, the forging of a God. The halls are judging, allowing only to those spiritually ascended to proceed and unite with the omniscience of the Ancient Gods. Within this meaning we can find the essence of Amenti, as this album crowned an ascension for the coven and a huge step, a passage to a higher level which is baptized and celebrated with this opus of musical, lyrical and philosophical work. I will reveal no more though, as this album should be regarded as a journey that the listener should make and discover the essence of the album, to dive into the Stygian waters and witness the mysteries. The halls of Amenti are now open for Those of the Blood… A call for the Individual to be Initiated or a poison to the ignorant. So, Acherontas V. Priest, your latest album is called Vamachara, which can be translated as ”a left hand path”. What kind of a step is this new album on your own path? Are you achieving some goals already with this full-length, or are there still many miles to go? – The creation of an Acherontas album is a rather spiritual process. It is a creation evolving from raw fragments which mature as it is being fed with our own poison. The first step into the Abyss was to establish the lyrical concept and the Acausal Current upon which Vamachara with emerge from. Then we gave a skeletal form to the album with the addition of the sonic element, to emerge its dissolving beingness after the production was completed. An Offering to the Dark Gods! Evolution is very important for us in our lives in all the ways..
Acherontas’ lyrics always get me thinking about the differences between poetry and sermons. How much of your writings are pure liturgies of magick and how much your own personal views and figments of the imagination? – Imagination has strong links with magical activities, but our lyrics are not based in theory. Theory without practice is nothing. The philosophical background of Acherontas deals with our experience in sorcery. Well, at least there have been many different gods mentioned in Acherontas’ lyrics during these years. Do you see them as separate entities or are they just embodiments of the same force and power? And what could this power be? – Our philosophy deals with the Draconian current. Many archetypes and forces are mentioned in our lyrics. – Occultism for us is the knowledge, the weapon and the Way to uncover the “Higher Self”, to become vessels of Acausal Drakkonian energy. We, as separate individuals, explore occultism in a different way since the whole alchemical advancement differs among practitioners as the elements differ from each other. Whereas when it comes to Acherontas we all unify into one; one All-consuming Δρακονιαν flame! If you think about yourself, what is your and your band’s role in this big scheme? Is Acherontas a vessel or a gate for magickal powers, or do you understand yourselves as more independent actors? I guess Acherontas isn’t “just a band” which makes “just good music”, right? – Right. As I explain before the members of Acherontas are vessels of Acausal Drakkonian energy… Our music is a gate for some…. We are real to those with eyes to see… We open links to higher levels for individuals with the potential to embrace the serpent divinity. But how well does (black) metal serve these themes and purposes? What are the similarities between the music of Acherontas and occultism in the case of Vamachara for example? – Vamachara streches back to the buried past, regressing back when the female archetype was worshipped through the Cult of Vama, the falsely so-called excremental, cast-out, leftovers of spiritual practice, labeled as such by unaccomplished followers of the Solar Gods. The lunar waters shall possess the Soul essence with the blood current of Immortality, pushing the Adept towards self excellence through the imbibition of the nectar of Salvation that is Amrita, through ordeals of black Al-Khemy. The vultures on infertile grounds of the desert cry LA ILAHA ILA ANA, and you shall kneel to drink from the cup of the fornications of the priestess-either dust or Fire. Enter the Womb of the Black Moon and be reborn… Let the feathers of Abraxas reflect the function of Samsara. Vamachara is a very strong album in my opinion. It isn’t the most original album but maybe this is its strength: it bows to the canon of black metal (especially the early nineties’ era) and uses old tricks effectively. Everything flows naturally and every note is in a right place. I guess the originality isn’t the main thing to you, and you are making music that is coming naturally from you, but how aware are you of the music that exists already and you have listened / are listening? – We create only when we feel the need to express our thoughts and experience through our art… So when purity is the law of creation then you can create something original straight through your soul. Black metal is art. When you are true with yourself, then only art you can create. One difference between the old albums of Acherontas and Vamachara is that the music and its spices are drifting away from its Greek roots, in my opinion at least. Is there any “Greek factor” in your music (what for example Kawir uses very strong)? And how about Greek gods or pagan rituals, do they have any room in Acherontas? And like said before, the album is like a sermon or a mass, so how would you describe Vamachara’s structure (a song order etc.) from this point of a view? Is it telling a story or is it more like a journey or something else? I guess everybody has noticed that this is the fifteenth year of Acherontas. The compilation called 15 Years Anniversary of Left Hand Path Esoterica was released and you mention this 15 years anniversary also in the booklet of Vamachara. Why is this so important thing to you? It is the number or this specific moment? If you look back now, what have been the highest peaks and the darkest moments of despair in Acherontas’ career? Have you risen higher and higher with every step, or has the ride been bumpier, so to speak? – I think evolution is our goal. Many difficult states we had passed but all are experiences. Everything in life, even good or bad, depends from the side you see it. Even the most worst experiences – if you embrace them as a challenge and not as a problem then you will get stronger. And if you think yourself as a person, has your own spiritual growth gone hand in hand with Acherontas? How much Acherontas is you and vice versa? So this is the end… Let’s close this interview with a high-flying question – if Acherontas ended its path today, how would you like to people to remember Acherontas? What would be written in Acherontas’ obituary?